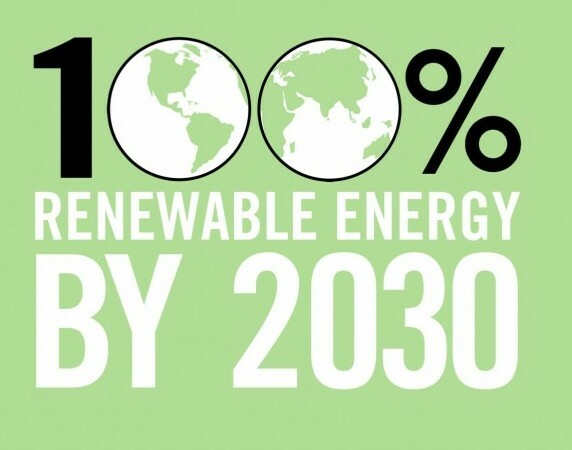 (Earth Day) More than 70 environmental, faith and labor groups today announced they are launching a campaign on Earth Day to require New York State to transition to 100% clean energy by 2030. The groups have asked Governor Cuomo to amend the existing Executive Order for an 80% reduction of greenhouse gas emissions by 2050 to a 100% clean energy goal by 2030. The groups plan to introduce state legislation as well. The campaign builds upon the Jacobson wind, water and solar (WWS) study by Stanford and Cornell Professors, among others. The WWS study shows that it is technologically feasible for New York to produce zero net carbon emissions by 2030, using only technologies that are commercially available today. The campaign will seek to overcome the political obstacles to achieving this. The goal pertains to energy for all purposes, including transportation, heating/cooling, and agriculture. The groups want the state to fund a more detailed plan on the concrete steps and timelines needed to make this a reality. “While New York officials can point to positive steps they have taken to support renewable energy and better manage the power distribution system, it is not enough to deal with the threat from climate change. And they continue to support hundreds of millions of dollars of investment in coal and fossil fuel infrastructure while impeding the development of clean energy, starting with off shore wind,” said Mark Dunlea of the Green Energy and Legal Fund, which is helping to coordinate this campaign. “Imagine a clean energy Empire running from the mighty waterfall at Niagara to the steady sea breeze off Montauk! New York, which led the industrial revolution in America, could be at the forefront of the great green energy revolution now poised to sweep across the continent,” said Bill McKibben, co-founder of 350.org. “For the first time in human history, we can generate heat, as well as electricity, without burning anything; renewable sources of energy — wind, solar and geothermal — are in infinite supply and all human-beings have equal access to those 3 sources of energy. The development of renewable sources of energy for practical use is a monumental step in human progress. Totaling all the costs, generating electricity from renewables is much less expensive than using nuclear or fossil fuels. We need to switch to 100% renewables ASAP to ameliorate the effects of climate change and make an investment in peaceful human evolution. Let’s do this by 2030,” said Charley Bowman of the Renewable Energy Task Force of the Western New York Peace Center. The groups do not include nuclear power as clean energy. Green energy is also the path to full employment and lower energy rates. It is estimated that the build out to 100% clean energy would create 4.5 million jobs (the equivalent of 280,000 40-year jobs). According to the study, these job estimates are for energy production facilities alone. They don’t include the additional jobs that would be created in transmission and with the conversion to electric and hydrogen fuel cell vehicles, electricity based appliances for home heating and cooling, and electricity and hydrogen use for some heating and high temperature industrial processes. And they don’t include jobs associated with increased energy conservation and retrofitting. Jannette Barth, economist, and one of the coauthors of the WWS study, says that the positive economic impacts would extend beyond job growth. ‘Estimates indicate that illnesses and death caused by fossil fuel based air pollution cost the taxpayers of New York State about $33 billion each year. And, with the Jacobson wind, water and solar plan, the real estate market and property tax revenues would likely benefit as rooftop PV and solar thermal technology installations tend to increase home values,” said Barth. Electric rates would be at least 50% lower compared to continued reliance upon fossil fuels. And is it estimated that greater efficiencies of modern technologies will result in 37% less total energy use. “The NYS Public Employees Federation (PEF) is on board to meet the challenge to help achieve 100 percent clean energy in New York State,” said PEF President Susan M. Kent. “Investing in climate change legislation is a labor-environmental partnership that addresses several critical issues. When we choose to go forward with a new direction for our state, and country, we must make sure that a clean energy economy is the foundation for putting people back to work. It is important that legislation connects environmental justice to economic justice in a way that supports communities and public services with good, green jobs,” said Sue Kent, President of the Public Employees Federation. The groups said that a key focus will be to reduce the amount of energy used through strong energy conservation and efficiency programs, starting with buildings. The WWS study estimated that wind would be the largest source of power (40% from off-shore, 10% on shore), followed by solar (around 40%). Many groups feel that geothermal heating and cooling pumps have strong potential for NY as well. “The Governor should initiate a program to immediately energy retrofit every government building in the state, installing solar or geothermal heat and cooling pumps when needed. And public authorities like LIPA need to take the lead in developing off shore wind,” added Dunlea. LIPA recently rejected a major off-shore wind project on the same day the Governor announced that he was not going to allow high volume hydraulic fracturing for natural gas. Many of the groups are also pushing for enactment of a state carbon tax and for the state to divest its pension funds from fossil fuel companies. The groups also believe that much of the success of the campaign will come from local initiatives to promote renewable energy, sustainable agriculture, mass transit, energy conservation and 100% clean energy goals. More than a decade ago New York established a goal of 30% of the state’s electricity coming from renewable energy by 2015. Only 22% is now being provided by renewables, an increase of only 3% of the last decade. The state’s Renewable Portfolio Standard sunsets this year; the campaign wants a much larger initiative, with clear benchmarks for individual utilities. The groups recognize that even if the political will is found, it will still be a challenge to convert to 100% clean, no-greenhouse-gas emissions by 2030, especially for transportation. The last few percentage points will be the most difficult and expensive. This is why the campaign supports net zero emissions. While opposing the concept of clean coal through carbon sequestration, the coalition does support the enormous potential for carbon sequestration in soil ecosystems that are restored to life through organic agriculture. Professor Steve Breyman at RPI has his class this semester studying details about the Jacobson study, including financing. “My students are double-checking the feasibility of Jacobson and his team’s claims. But even if this or that piece of the transition will take longer than 2030, there can be no doubt that New York ought to be moving in the direction of 100% WWS as quickly as possible,” he said. As Jacobson’s WWS plan is only one example of multiple feasible plans, this campaign requests that New York State fund a comprehensive study to create a final detailed plan and timeline to transition the State to 100% wind, water and solar energy by 2030. Initial endorsers of the campaign are: 350 NYC, Abolition 2000, American Hydrogen Northeast, Beloved Earth Community The Riverside Church NY, Bronx Climate Justice North, Bronx Climate Justice South, Buddhist Association of the United States, Capital District Against Fracking, Capital Region 350 Climate Action, Carroll Gardens Association, Catskill Citizens for Safe Energy, Catskill Mountainkeeper, Center for Popular Democracy, The Center and Library for the Bible and Social Justice , Citizens Committee for New York City, Citizens Environmental Coalition, Climate Justice (Union Theological Seminary), ClimateMama, Code Pink, New York, CREEC, D&G Consulting, Earthcare Working Group of the NYYM Religious Society of Quaker Friends, Eco Practicum, El Puente, Green Light District, Empire State Medical Association, Environment NY, Fellowship of Reconciliation: Veterans; Food and Water Watch, Fort Greene Peace, Franciscan Earth Corps, Gandhi Earth Keepers International, Grail Climate Action Circle, Green Education and Legal Fund, Green Hybrid Energy Solutions, Green Party of NYS, Hydrogen Association, Ithaca College Progressives, Jim Owles Democratic Club, Manhattan Central Medical Society, NYMetro Raging Grannies, New Paltz Climate Action Coalition, NY Granny Peace Brigade, NYC Friends of Clearwater, One World Zlife Systems, Pachamama Alliance NY/NJ Metro, Pax Christi Metro New York, Peace and Justice Task Force of All Souls Unitarian Church/NYC, People of Albany United for Safe Energy (PAUSE), Public Employees Federation, Rain Forest Relief, Renewable Energy Long Island, Renewable Energy Task Force of the WNY Peace Center, Sadhana: Coalition of Progressive Hindus, Sane Energy Project, Sierra Club Atlantic Chapter, Sixth Street Community Center, South Brooklyn Youth Consortium Coney Goes Green, Stop the Minisink Compression Station, Students Against a Vanishing Environment (Peru NY), Students of Sustainability at Syracuse University, Sustainable Flatbush, Sustainable Warwick, System Change Not Climate Change, Troy Area Labor Council, United for Action, WESPAC Foundation, West 80s Neighborhood Association.